The town of St. Helens, OR has a functioning swimming pool that was built in 1939 by the WPA. This pool has a tunnel that surrounds the pool so the pipes are accessible. There is a large pool with an adjoining smaller pool. Many of the golf courses built during this period were constructed by the CCC, but these were specifically built by the WPA. At this time, Rand Jerris of United States Golf Association is working on a research project to identify any golf courses built by the WPA or the CCC. If you know of any other WPA or CCC golf courses, please email Dr. Jerris at RJerris@USGA.org and help add to this list! There is a great site entitled "WPA and New Deal Golf Courses" which has additional information! Keller Golf Course in St. Paul, MN - The clubhouse and pro shop were constructed with stone and mortar as W.P.A. projects. New Golf Course, New Orleans, LA. - constructed by WPA as part of the vast City Park Improvement program. George Wright Golf Course in Hyde Park, MA - Designed by the famed Donald Ross as a WPA project in the 1930s, George Wright was built on a site unfit for a golf course. Fish Hatchery in Rochester, IN near Akron, IN. Located in Lakeview Park on north side of east Ninth street (formerly Mill Race Park) the Federal fish hatchery was built in 1935 by the WPA: it now includes a municipal golf course, and a swimming pool. Senecaville Fish Hatchery, Senecaville, Ohio - built in 1937 by the WPA. Feather River Bath House in Oroville, CA - In the mid 1930's the WPA built the rock bath house. The bath house provided showers and restroom facilities for the swimmers and sunbathers. 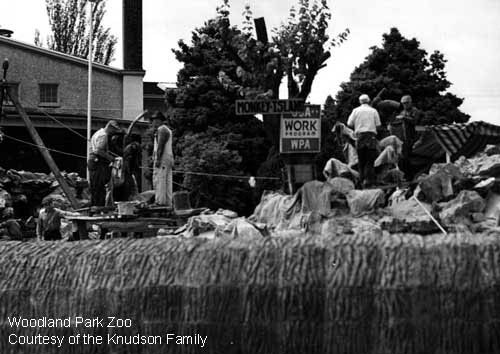 Woodland Park Zoo in Seattle, WA was partially built by the WPA including "a totem pole designed by Frank Vincenzi and carved by WPA labor was set up in the southwest part of the zoo not far from the 55th St./Phinney Ave. entrance. The Vincenzi pole was removed at an unknown date and also never replaced."